Ride My Bike Serif is the new serif version of the immensely successful Ride My Bike handmade typeface created by Guisela Mendoza and published by Latinotype. Featuring an authentic vintage street style and new Latino culture, Ride My Bike Serif is perfect for headlines, brands, fashion and photography. 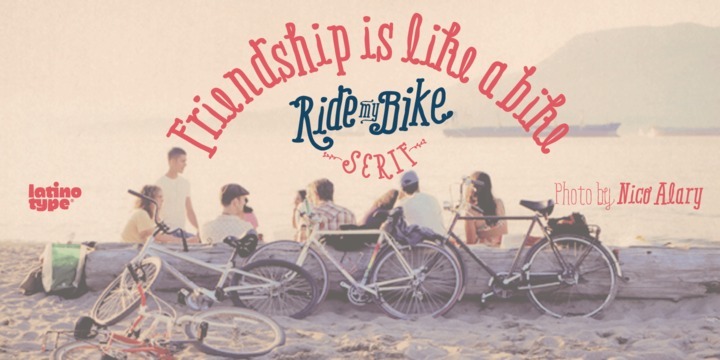 The Ride My Bike Serif Ornaments font bring even more awesome to the table, containing over 120 dingbats that are fun and very useful for handmade styles designers. You gotta ride this bike! A font description published on Thursday, March 20th, 2014 in Fonts, Guisela Mendoza, Latinotype by Andrei that has 5,983 views.